Height 5' 8½", Weight 204 lb. Jack Clements was the last left-handed catcher to play regularly in Major League baseball; he was also the greatest lefty catcher ever. Clements played 17 seasons in the big leagues. Although he occasionally played in right field or elsewhere, the vast majority of his appearances were at catcher. He was an above-average hitter who was sometimes among the league leaders in batting average or slugging. Jack was born in 1864 in Philadelphia, PA. The year 1864 may sound early, but there were well over 100 Pennsylvania-born players who broke into the majors before he did in 1884. At age 19, Jack broke in with the 1884 Philadelphia Keystones of the short-lived Union Association. His manager was the old-time catcher Fergy Malone. Jack was one of the strongest hitters on the team. 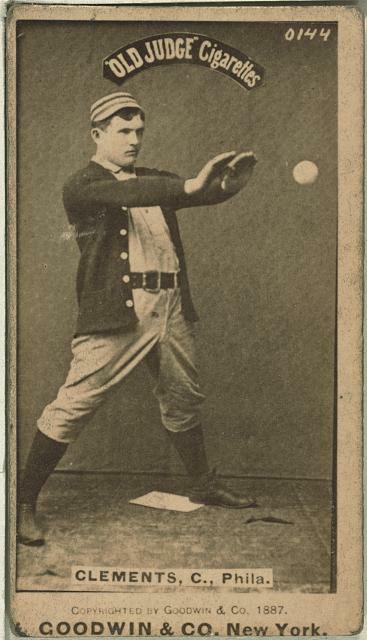 In August, Jack signed with the 1884 Philadelphia Quakers of the 1884 National League, and while he didn't hit as well for them, it was the beginning of a 14-year stint with the Philadelphia National League team. In 1890, Clements made a leap forward, and became a good hitter. His power and his on-base percentage both went up in relation to the league averages. For the first time, he was among league leaders in batting average, finishing third in the league, and he was second in slugging percentage. He continued to be among the leaders in both categories in 1891, and while his batting average went down in 1892 and 1893, he was still one of the top sluggers in the league. In 1895 he was again in the top three in the league in both batting average and slugging percentage. Jack's hitting slipped substantially in 1897, and he was traded, in a deal that involved six other players, to the St. Louis Browns, at the time in the National League. He played as a regular for the Browns in 1898, and the following year was briefly with the terrible 1899 Cleveland Spiders, who released him fairly early in the season. In 1900 he spent some time with the Providence team in the Eastern League, and also appeared in 16 games with the 1900 Boston Beaneaters managed by Frank Selee. He hit pretty well, at .310, but the regular catcher Boileryard Clarke hit .315. This page was last edited on 17 January 2015, at 07:23.